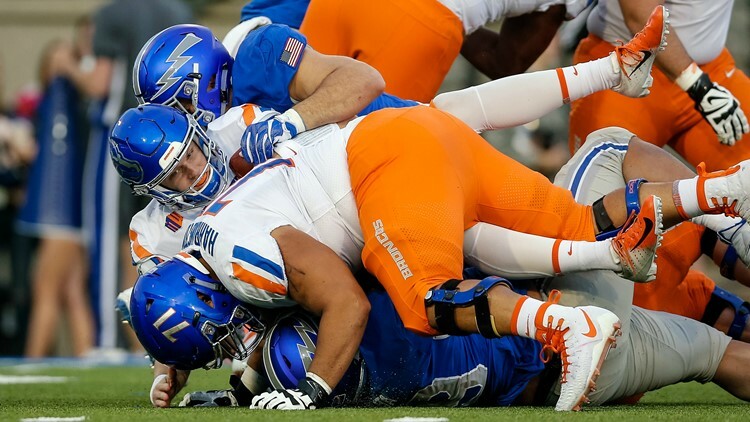 Boise State Broncos offensive lineman Donte Harrington (71) defends as quarterback Brett Rypien (4) is sacked by Air Force Falcons defensive lineman Micah Capra (90) and defensive lineman Mosese Fifita (99) in the second quarter at Falcon Stadium. Boise State football: True test of Rypien’s toughness? It's imperative that the Boise State offensive line and friends keep Brett Rypien upright in the battle for the Milk Can. It won't be easy with No. 9 on the prowl. Brett Rypien has taken some hellacious hits this season, but he’s kept on tickin’. Big hits are Fresno State’s calling card this year, as noted by Fresno State play-by-play man Paul Loeffler yesterday on Idaho SportsTalk. “After a quarterback gets hit by No. 9, the game changes,” said Loeffler. No. 9 is linebacker Jeffrey Allison, the Bulldogs’ leading tackler and a Preseason All-Mountain West pick. Allison was dinged on the first drive of Fresno State’s rout of UNLV last week and was held out the remainder of the game. The speculation is that it was precautionary, as the Rebels offense wasn’t going to pose much of a threat. They saved him for Rypien. Boise State used to build a fortress around Kellen Moore, giving up only five sacks in all of 2009 and eight in both 2010 and 2011. Rypien has been sacked 23 times already this season. Now that its exhibition win over Vanguard is in the books, Boise State turns its attention to the official season opener versus Idaho State Saturday night in Taco Bell Arena. And this will be a special one for Pocatello’s Malek Harwell. Not only is he looking forward to facing his one-time hometown team, he anxious to finally break through as a Bronco. Harwell started and played 31 minutes Monday night, scoring 12 points and adding 12 rebounds. Coach Leon Rice was really high on Harwell, USA Today’s 2015 Idaho Player of the Year out of Century High—then he tore the ACL in his right knee during an October practice and missed the entire season. He’s been playing catch-up since then and has scored a total of 30 points in 25 career games. Boise State clinches its first winning season as a Division I-A school with a wild 55-51 victory at New Mexico State. The back-and-forth track meet saw Bronco quarterbacks Nate Sparks and Bart Hendricks throw for over 200 yards each. It was an emotional moment for Boise State seniors who two years earlier had endured a 2-10 season and the death of coach Pokey Allen. Dirk Koetter, in his first year as head coach, hailed it as a night to remember. No one anticipated the amazing story that would begin to unfold the following season.